These hollies make perfect accents at the corners of your home, in the flower garden or entryway. The dark green foliage makes a great contrast to surrounding trees and shrubs. During the winter months you will enjoy the red berries against the deep green foliage. Clip some branches to decorate your home for the holidays. Bird watchers delight as these berries attract all kinds of wildlife! 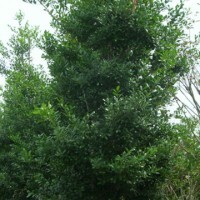 Unlike most varieties of Holly, these grow tall and stay deep green all year round. Nellie Stevens Hollies grow in sun or partial shade. In addition to being attractive, these trees can be planted and forgotten. They withstand poor soil, drought and even neglect.